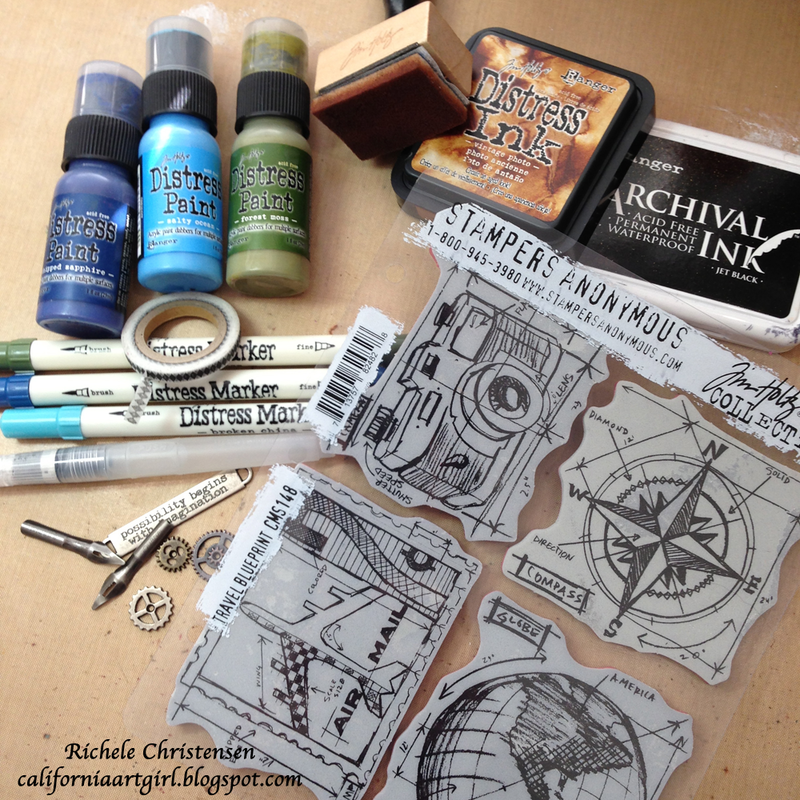 Have you seen the challenge Tim Holtz is having?? 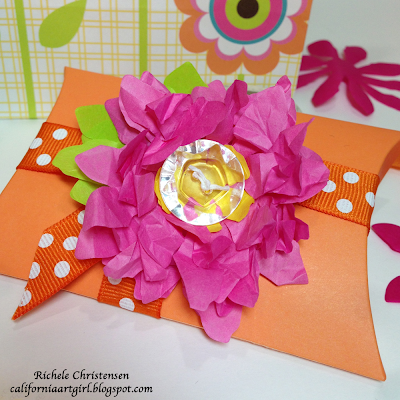 Yes the Tattered Floral Die Challenge! It's with the BEST die every! If you don't own this die you could win one just by leaving a comment here on my blog. 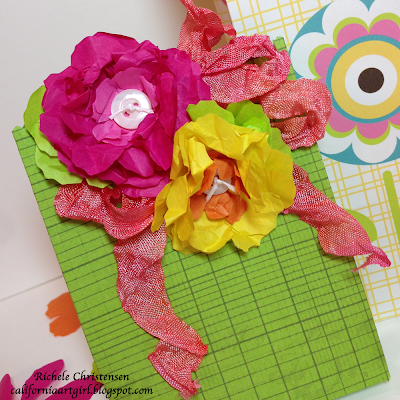 Bring on SPRING with Tattered Flowers!! 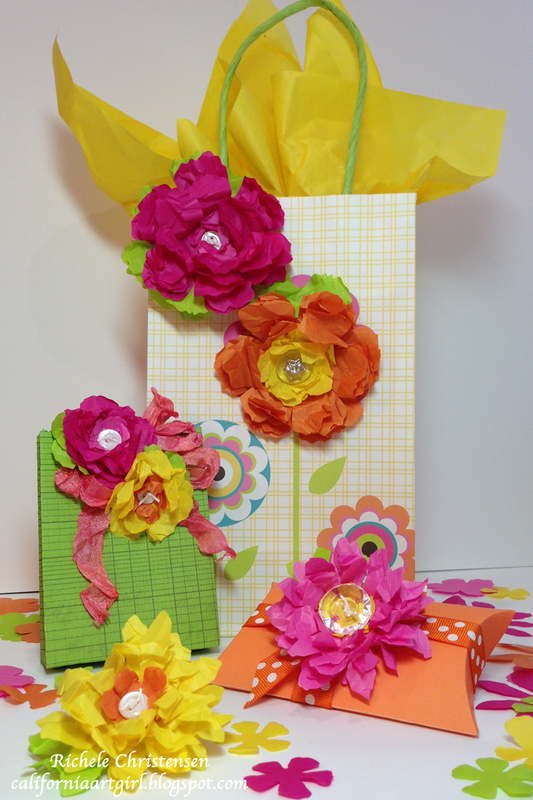 I wanted to make some flowers with fun bright colors of tissue paper. So off to my favorite store, Target to get some tissue paper! While there, I also picked up some gift bags. Look at how beautiful they make these packages look. 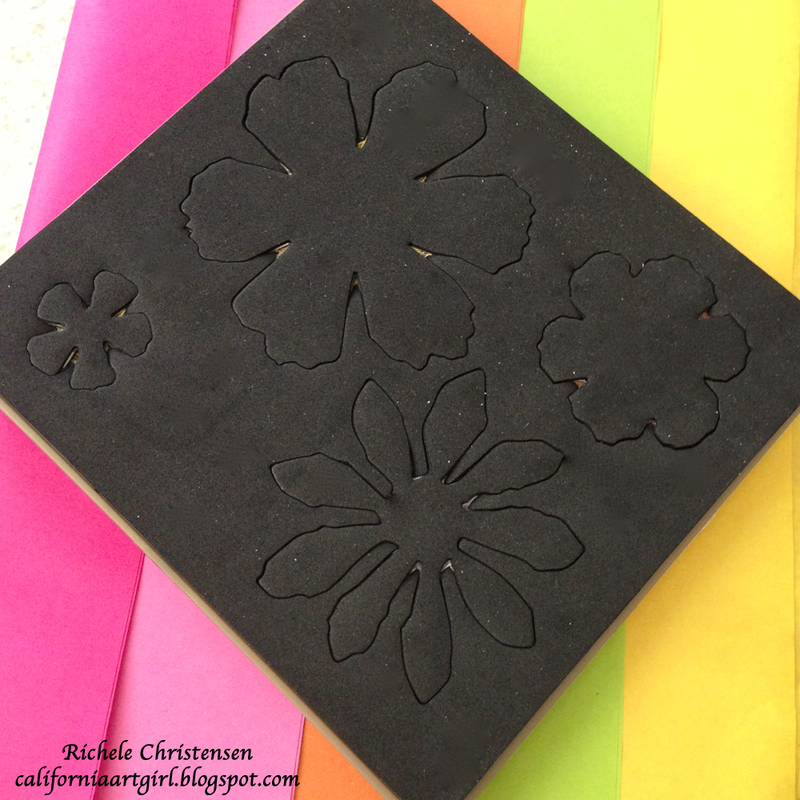 I started by die cutting the tissue paper using my Tattered Floral Die. Because it's a steel rule die it will cut just about anything. From the thinest material like tissue paper to heavy grunge board and everything in between. 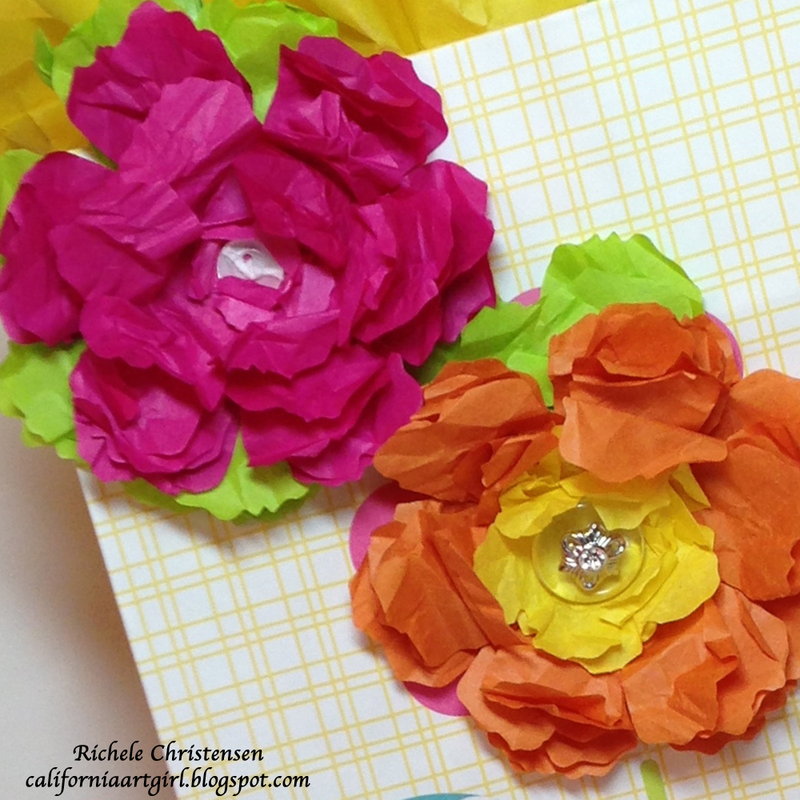 Take the die cut flowers and scrunch up all the petals of the flowers. I found it easiest to do one petal at a time. I tried scrunching up the whole flower but when I tried to open it up the petals tore. 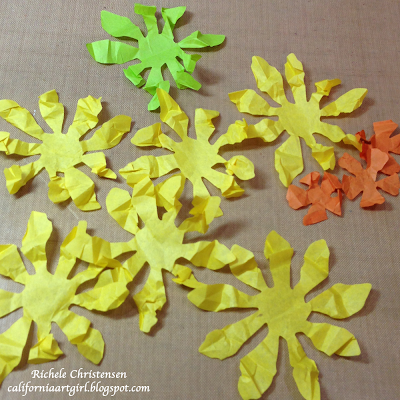 Each flower is made from 6 big flowers and 2-3 small flowers for the center. 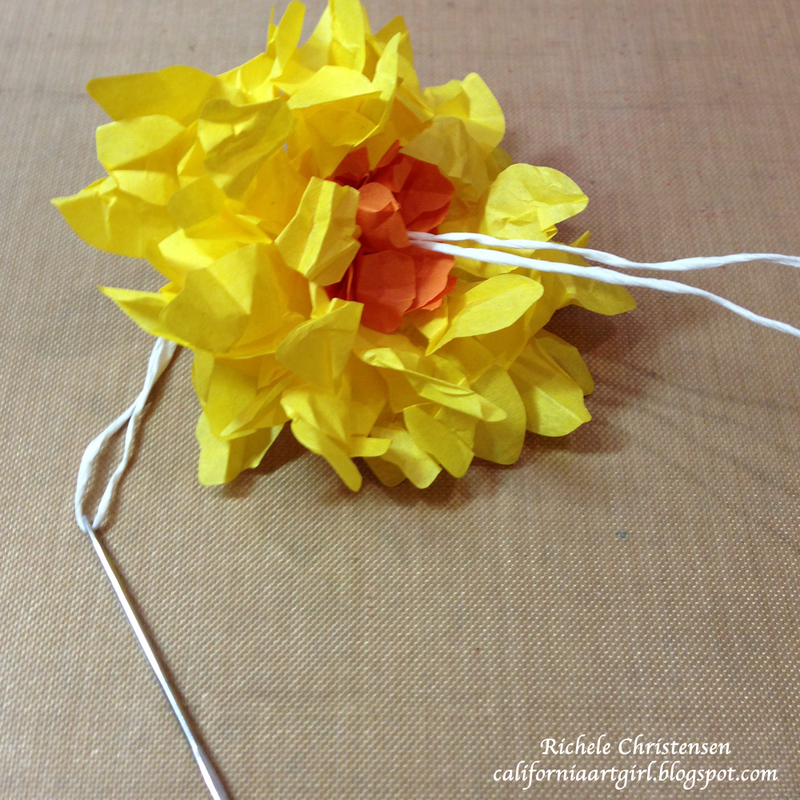 Once you have scrunched the flowers up thread a needle with string. I used approximately 8" of string. 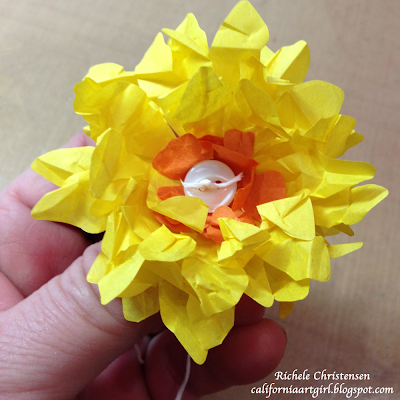 Push the needle through the center of all 6 larger flower and a couple smaller ones for the center of the flower. Tie a button for the center of the flower. Cut the string to remove the needle and tie off on the back side of the flower. 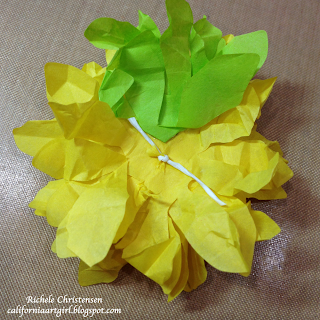 Fold a green flower for the leaves and adhere to the back. Here is a closeup of the flower on the store bought gift bag. I dyed some Crinkle Ribbon with Distress Stain, tied the little bag closed and added my flowers. The die for this is called In The Bag, another great die. And look at this Pillow Box another fabulous die from Tim. Super cute! This box is the perfect size for a gift card. Don't forget to leave a comment before March 22nd at midnight PST for a chance to win the Tattered Floral die and if I get lots of comments I will be tempted to throw in some more fun prizes!! What are you waiting for? Head over to Tim's blog to get started on the challenge! Before you go please leave a comment so you can be the winner!! If you need the Tattered Floral die find it at Inspiration Emporium! Hi blog friends! Are you working on your new years resolution to craft more? I hope so! 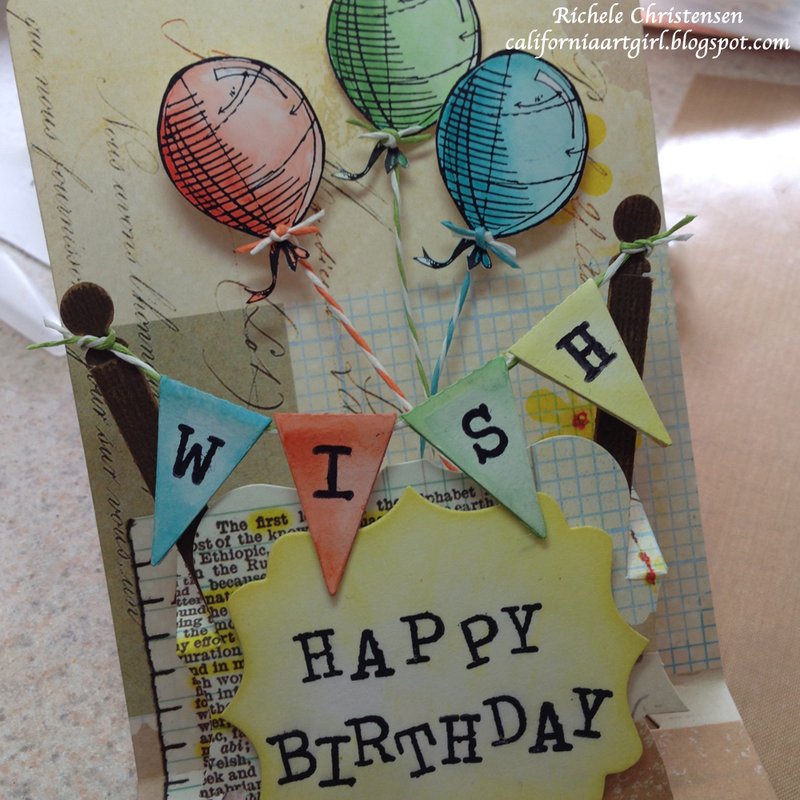 I've had a little time in the studio lately and look what I made for the Sizzix blog! This card features Karen Burniston's Pop 'n Cut dies along with the new Birthday blueprint set from Tim Holtz. And look at them together a match made in heaven. 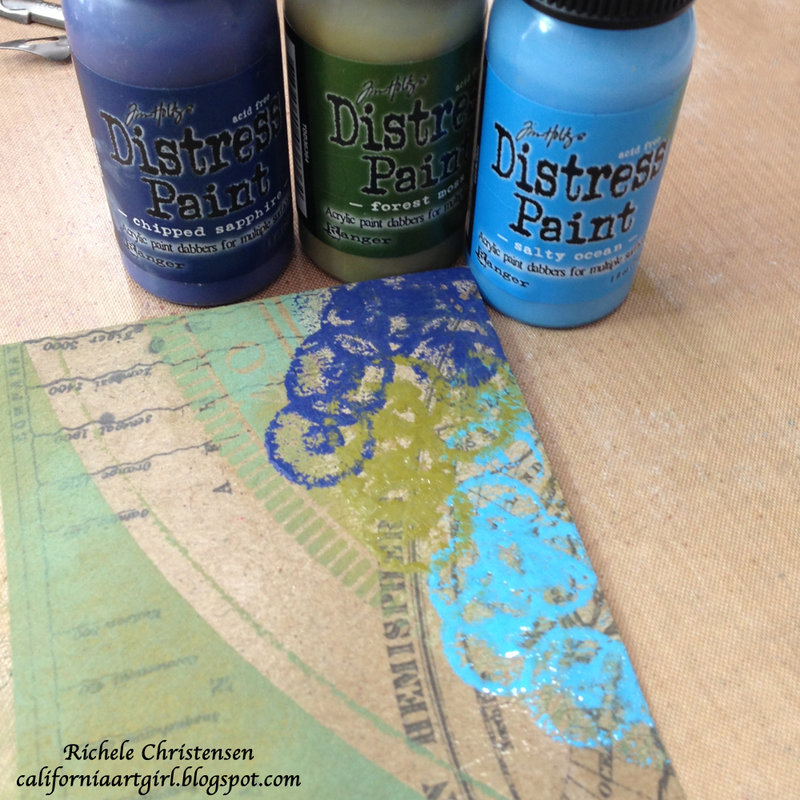 Paint with Distress Inks and add a few embellishments....WOW! Head over the Sizzix blog here to see the full tutorial. Have a great day! Thanks for coming by. Today I want to share the journey of blogging. I have really loved this creative journey and want to thank all of you for coming along with me! This card is for my friend Heather who lives in Nova Scotia, Canada. 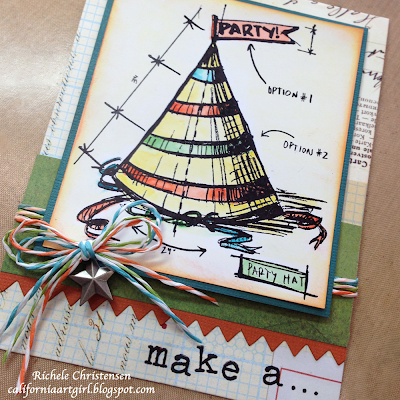 Heather made her first post today on her new blog called InkandFlour.blogspot.com YAY!!!! And it happens to be the same day I started my blog 2 years ago. What a funny coincidence! I hope you will pop over and say hello! 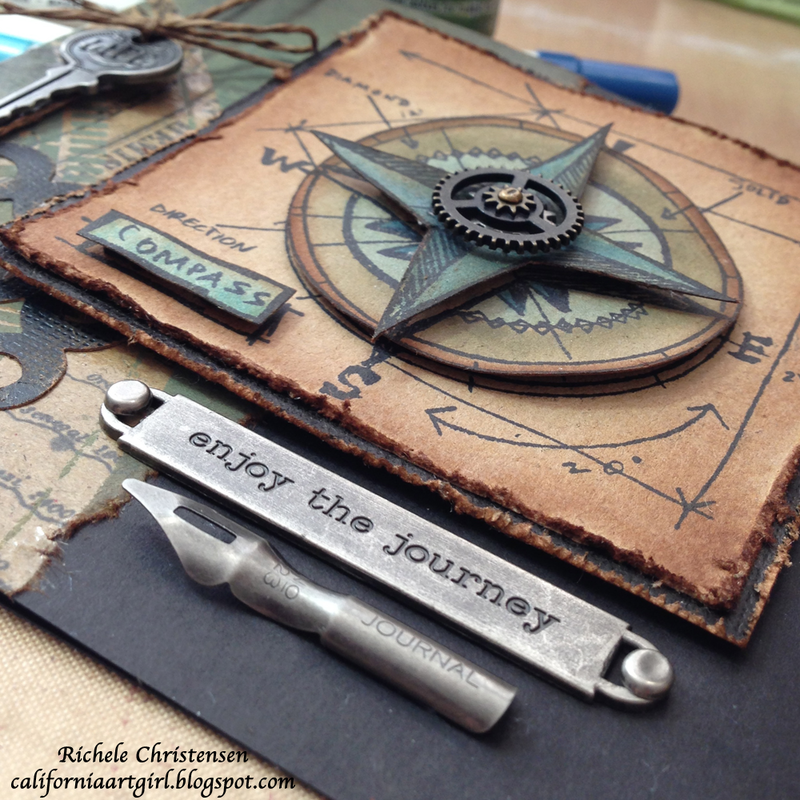 This card is all about "Enjoying the Journey". Here are a few things you will need to get started. 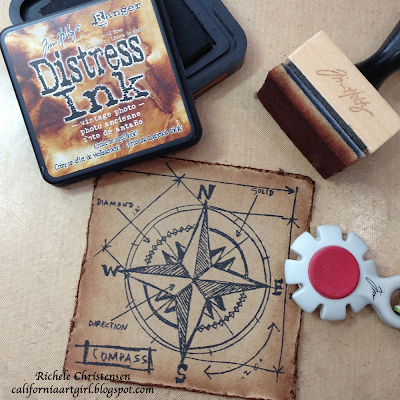 Distress Markers, Distress Paint, Detail Water Brush, Vintage Photo Distress Ink, Jet Black Archival Ink, Blending Tool, a little Idea-ology and some Stamps. 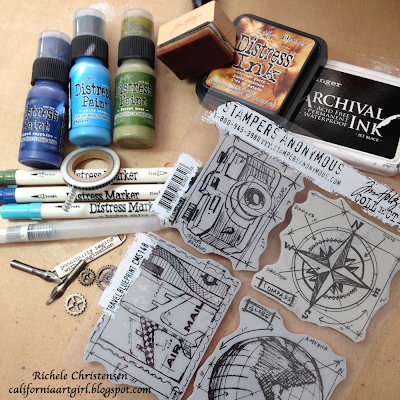 Don't you just love this Travel Blueprint set from Tim? Our base card will be a #12 black tag from Ranger folded in half. Cut a piece of Kraft resist about 3" wide by the height of the tag. Color the piece with Distress Paint by adding the paint to the surface. Dab with a baby wipe to blend the colors together. I used Chipped Sapphire, Forest Moss and Salty Ocean. When you're all done coloring your piece be sure to wipe the resist areas to reveal the kraft card stock. If you don't have the paints yet you can use Distress inks on an Ink Blending Tool. Tear the right edge of the paper. 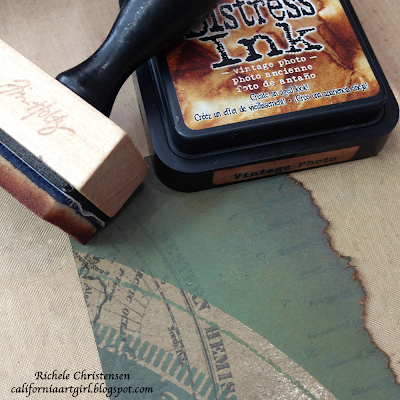 Ink all edges with Vintage Photo Distress Ink on an Ink Blending tool. Adhere to the left side of your card. 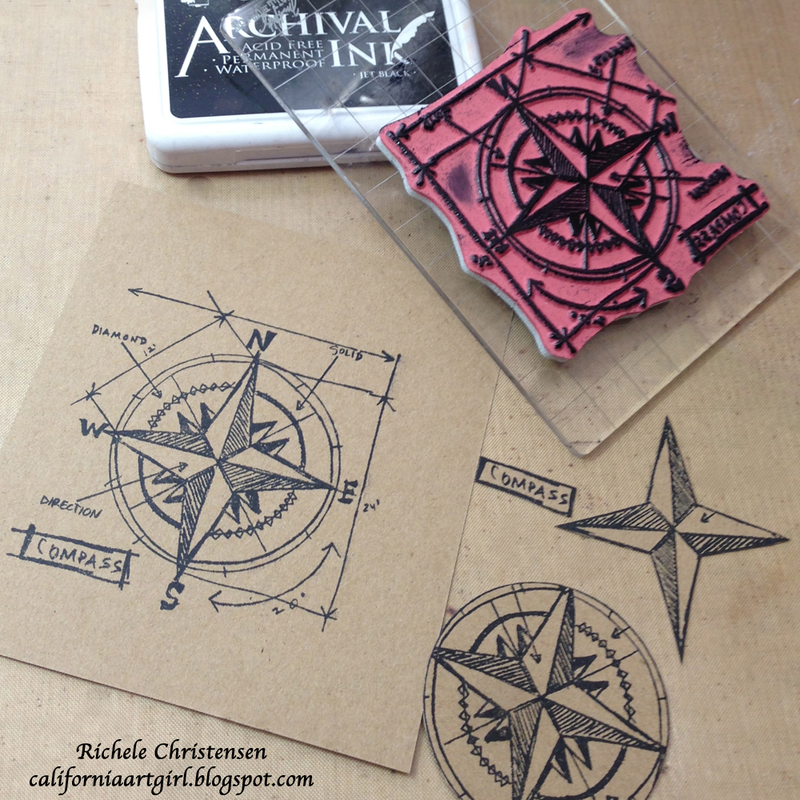 Stamp the Compass image 3 times onto kraft card stock with Black Archival ink. Cut the pieces out as shown. 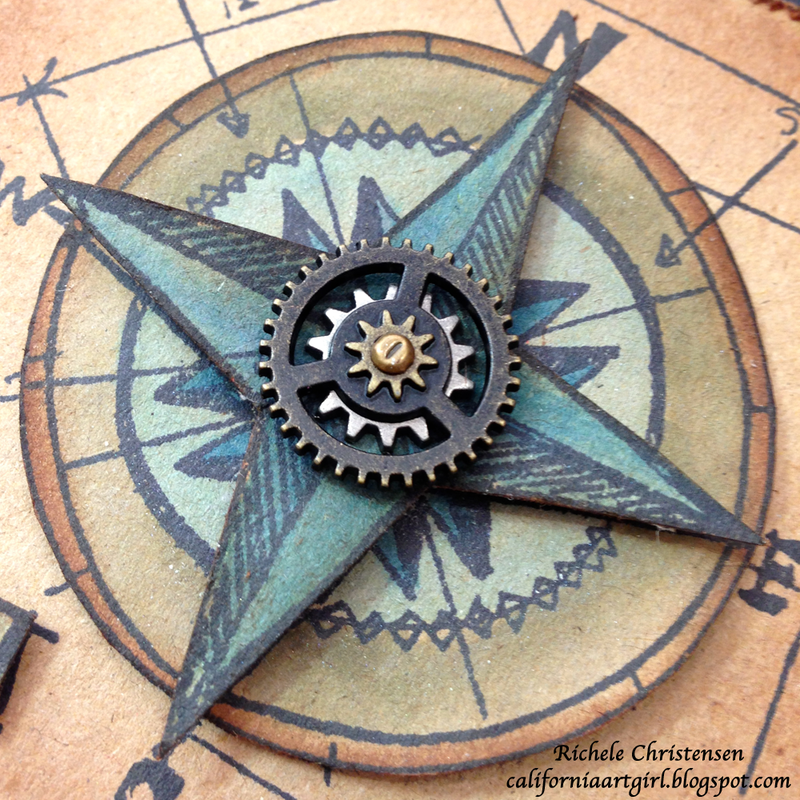 Using a Paper Distresser, distress the edges of the base compass image. Ink the edges with Vintage Photo Distress ink on an Ink Blending tool. Color the image with Distress Markers by applying the ink to your Craft Sheet, picking up the color with the Detail Water Brush and coloring the compass. 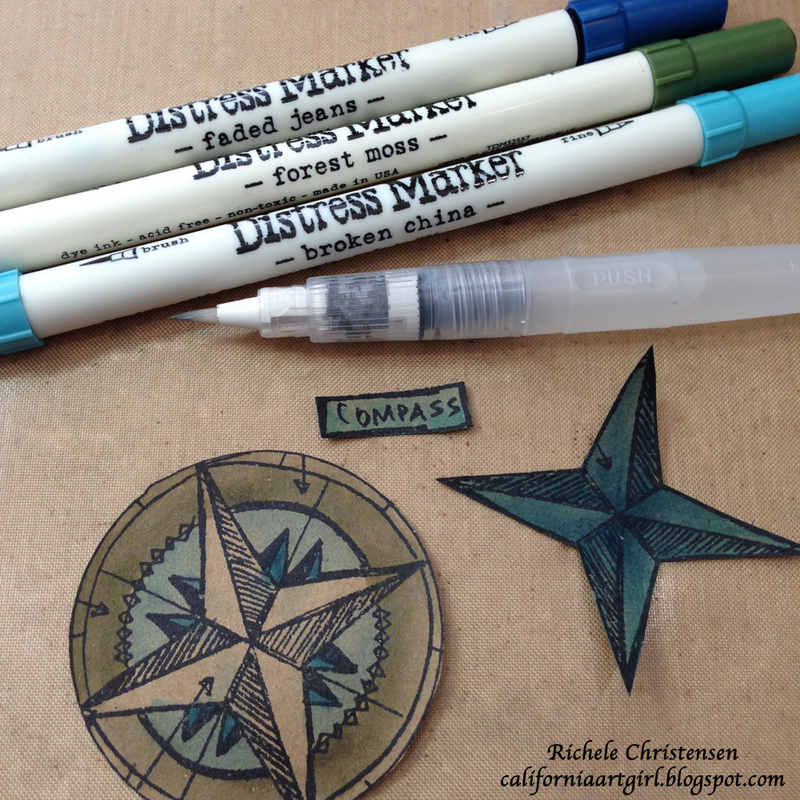 If you want the color fairly dark you can color the compass directly with the marker. 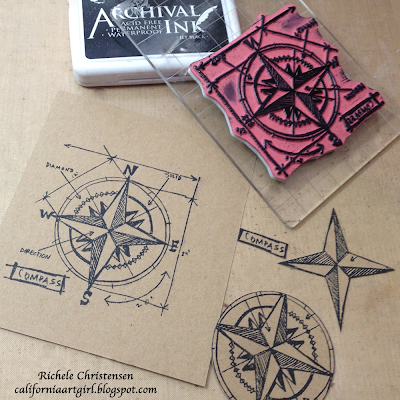 Using Vintage Photo Distress ink on an Ink Blending tool ink the edges of all the Compass layers. 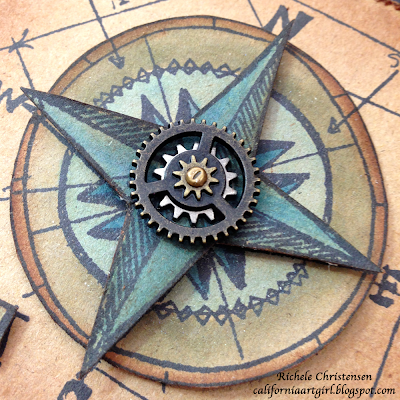 Add the Mini Gears to the center of the compass using a mini fastener. 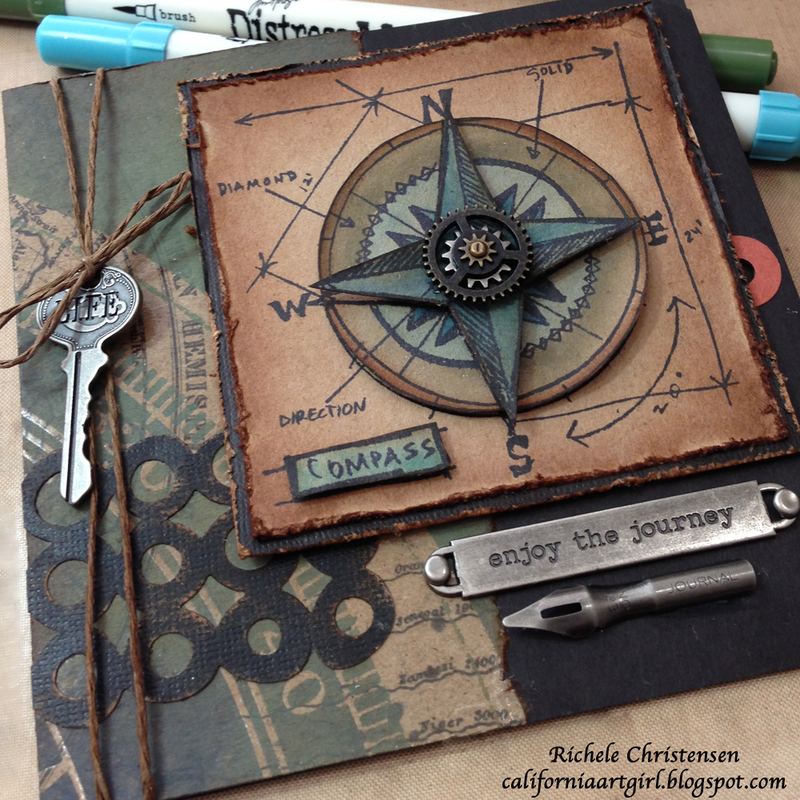 Pop dot the compass to create dimension. Mat the compass with a piece of Black Kraft'core the has been distressed with a paper Distresser and Vintage Photo Distress ink on an Ink Blending tool. 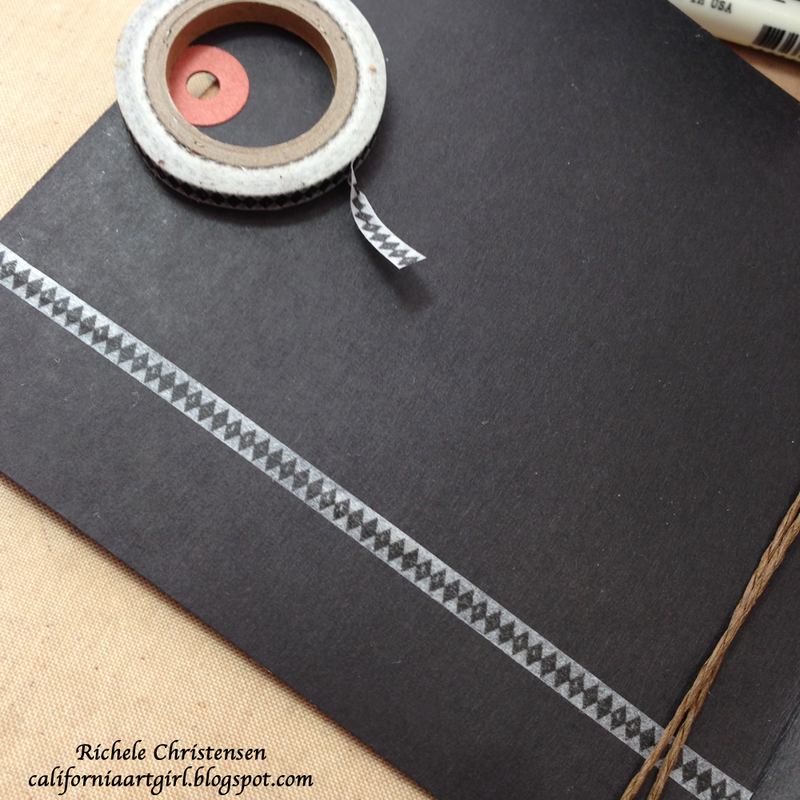 Die cut the Washer Border using Black Kraft'core. 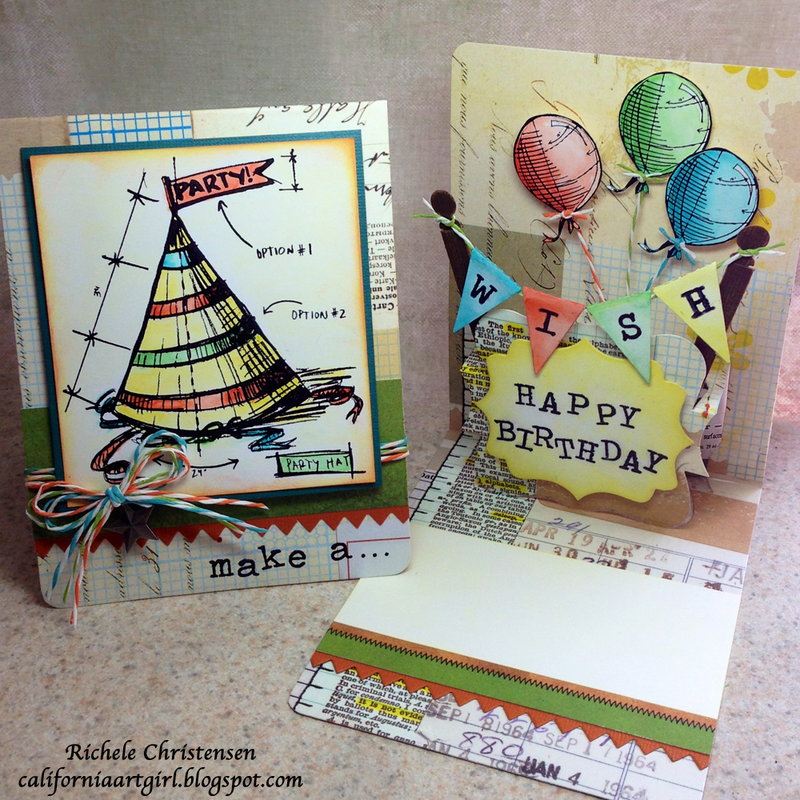 Sand the washer border, Ink with Vintage Photo on an ink blending tool and adhere to card. Tie paper twine around card with the "Life" key in the bow. Add the Word band "Enjoy the Journey" with long fasteners. Adhere the pin nib to the card. 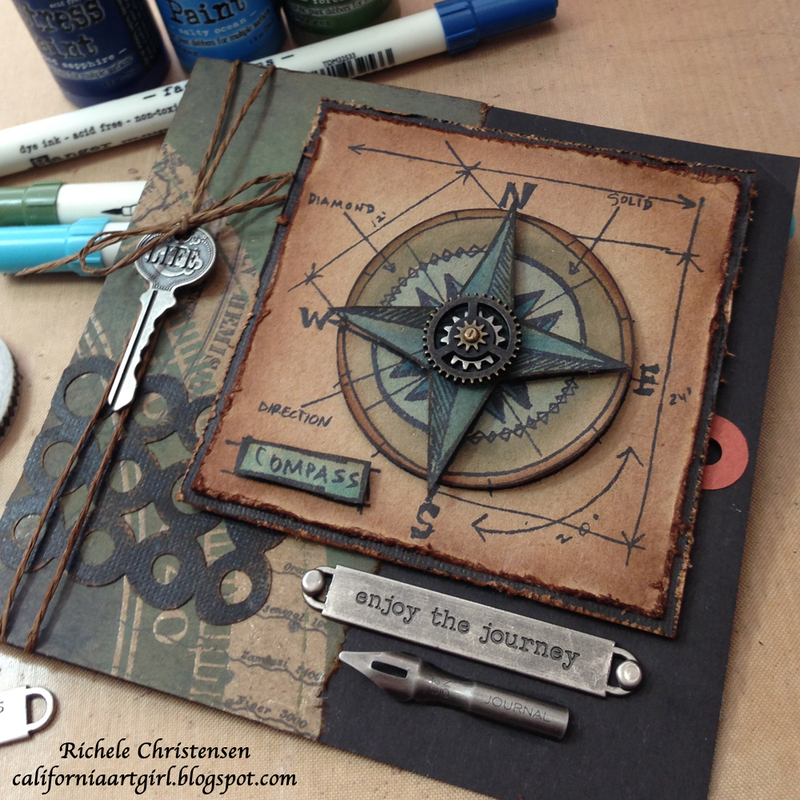 Pop dot the compass unit to your card. I love this trick! To cover the back of the hardware on the inside of your card use Tissue Tape. I love the dimension of this card, just by using pop dots. Take some time for yourself and "Enjoy the Journey"! Thanks for coming by and don't forget to say hi to Heather over on here new blog InkandFlour.blogspot.com. She has a beautiful tag for you to see. If you need some crafty goodness Inspiration Emporium has some! !